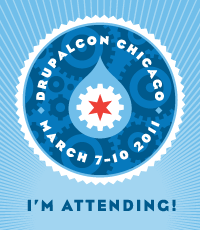 Oregon State University has representative members at DrupalCon 2011 in Chicago. The conference is a great way to hear about user experiences, get tips on how people approach development, and new services available that may benefit the University and others. Central Web Services and Web Communications are attending numerous sessions as we look to determine where to take Drupal sites in the future for OSU. The conference started out on day 1 with a Drupal music intro form members of Acquia, followed by the key note from Dries Buytaert, who spoke briefly about Drupal 7 and went into the aspects that worked well, and not so well. This segued to more on the new approach to Drupal 8, and the announcement that development on Drupal 8 opens on March 8th. There was a slide on the devices and market share of devices over time, and not-so-surprisingly, mobile devices are now in the lead, over desktops and notebooks. Tablets were also a part of the chart, and it was interesting to see on there, as my view also is that touch technologies will change the face of education, with the proper embrace of it. Dries stated that if they were to start Drupal now, they would start with mobile devices. He went on to focus on key initiatives he envisioned for Drupal 8, and that he’ll be looking for leads for the initiatives. What I liked was the fact that performance was also something they want to put as an up front consideration instead of an afterthought. Following the keynote, after a lunch session, and a BOF discussion, the day sessions began. Oh, what’s a BOF? BOF is Birds of a Feather, and what was done was some rooms opened up to groups of community members to get together to talk about mutual interests. We participated in the uWEBd BOF for University Web Developers, with representative University individuals sharing experiences and how they use technologies. I believe we can do more with Universities, such as setting up a common edu git location for all Universities to participate in module development, as an example. There’s more we can do to collaborate, it’s looking at the right strategy that can benefit many, followed by commitment and then execution. There were also discussions ongoing with the core team, or those dedicated set of people focused on making the core of drupal moving forward. Overall a good first day that sparks innovative minds to think about how to do things better, and how to tackle problems in the way things are.